From my book A Wellie Full of Water published by Medlar Press. I’ve known him for over twenty-five years, he’s one of the UK’s finest character actors, he’s cheered up our TV screens with his performances in Butterflies and As Time Goes By, and his supporting roles in countless movies are always a treat. He’s king of laconic delivery, an avid game fisher and, to coin an old-fashioned phrase, a jolly nice chap! When I thought I was competent enough to be seen on his local river Lodden, I bought a day with him in a charity auction. The weather and the setting were perfect. I wandered off downstream, while Geoffrey took the higher beat. I’d seen no sign of a fish until the river angled away for a few yards into a tunnel of Hawthorn. There, as the river turned almost at right-angles, a huge fish was sipping insects from the surface. There was no room to stand, so I crawled into the bushes, sat on the flap of my shoulder bag and flicked a tiny Hare’s Ear on three feet of leader towards the fish. Suddenly a voice behind me said, “Christopher . . . we don’t sit down when we’re fly fishing!” Since that time, I have knelt occasionally, but whenever I’ve been tempted to sit, Geoffrey’s words come back to haunt me. while his wife Sally, a talented artist, spends her time immortalising some of the more picturesque locations. 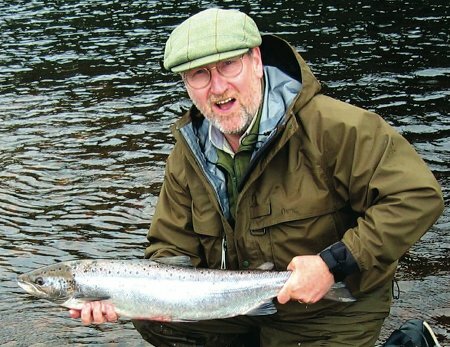 I’ve only fished for Atlantic salmon a few times in my chequered angling career and, as if it were pre-ordained, I’ve been met every time with the dreaded ‘low water’ . . . “You should have been here last week Sir, we were walking across their backs . . .” And of course as soon as I leave, anglers have to wear special trusses so as not to rupture themselves dragging gargantuan fish on to the bank! The year 2003 was a record year for the Tweed but, in spite of that, the Sandford ‘Low Water Curse’ took full effect for our two-day visit. I was convinced that Geoffrey now realised that to invite me anywhere near a salmon river would have the effect of most of the water draining back into the sea! So I was pleasantly surprised in early May of this year when he invited me for three days on the Lower Oykel. We arrived at the hotel within half an hour of each other and went immediately to the riverbank to pursue the traditional practice of looking at the gauges. There wasn’t enough water to wet their lowest extremities, let alone give an optimistic reading! So we took the only advisable action in these circumstances and had a nice cup of tea! We all agreed that the hotel was terrific . . . comfy beds, loads of hot water and great food . . . and the company, even better. The upside, as far as I was concerned, was that even with low water, once allotted my beat on this remote river, I could practice my Spey casting without causing too much hilarity among the locals! The Oykel is the most beautiful of rivers, and although nothing was caught for the first two days, it was a privilege just to be there and walk the banks. On the evening of the second day, the forecast promised rain which duly arrived and continued for most of the night. Breakfast on my last day was a very optimistic affair – even the ghillies were smiling. When we met at the lunch hut it was a different story. One of our party thought he had seen a fish but wasn’t sure, and that was about it. After lunch, everyone swapped beats and I was left looking at an exquisite stretch of river that had been fished hard all morning by the rest of the group. I sat and looked at it for half an hour, then it struck me. The water was ten feet deep and the other anglers had fished floating lines with their flies going no deeper than about two feet. I rigged my 9-foot 9-weight trout rod with a clear intermediate line and on the second cast managed to hook a salmon. George, the head ghillie, arrived in the nick of time and estimated the fish at eight or nine pounds. Geoffrey also caught a fish of about the same weight, so that evening there was cause for great celebration! It had been suggested to me that when dining at the Oykel Bridge Hotel, one was expected to wear a jacket and tie. I don’t mind fancy dress occasionally and had packed my most tasteless fish tie for the last night. I arrived in the bar to spasmodic applause. The barman reached behind the bar, smiled and produced exactly the same tie! I congratulated him on his good taste and joined the rest of the party. 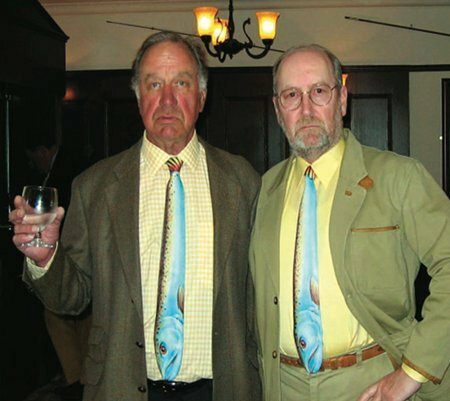 What I didn’t know was that he later sneaked the tie to Geoffrey who arrived wearing it and a deadpan expression, a few moments later!